This New York bakery has been creating their decadent treats and gifts since 2004. Chosen as one of the best mail-order brownies by the Today Show, and touted to bake brownies that satisfy “both the fudgy camp and the cakey camp,” by Chow Magazine, this much-praised bakery will not disappoint. A New York Bakery specializing in distinctively-packaged gift assortments. Perfect for those who love the classics, this bakery has four traditional brownie flavors which include original, walnut, chocolate chunk and peanut butter. Keeping it simple, New York Brownies’ offer their delicious brownie creations for purchase in gift box sets of four, 12 and 16. Those purchasing sets of four can select to include one or two of the bakery’s four popular variations. Similarly, sets of 12 and 16 can include one or two flavors, and can additionally be purchased in assortments including all of their wonderful flavors. Their brownies are not available for individual purchase at this time. This bakery’s delightful simplicity makes their website very easy to navigate, and makes your choices clear. However, they do not offer nearly as many flavors and variations as other mail-order brownie bakeries. They also do not offer as many gift assortment options as other gourmet bakeshops we have reviewed. This bakery also does not offer gluten-free, vegan, sugar-free or Kosher varieties at this time. 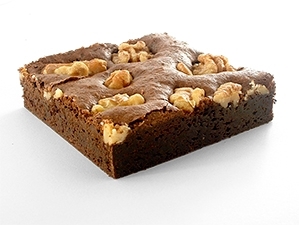 New York Brownies’ prides themselves on using only the highest-quality ingredients, with no preservatives ever. As previously mentioned, they are said to be the perfect blend of fudgy and cakey, for even the pickiest brownie connoisseur. Using only the finest ingredients is very important to New York Brownies. Their original brownies are dense and fudgy, and contain a high concentration of premium dark chocolate, and items like their walnuts are sourced from the best sources in California. The straightforward, simple approach of this bakery may also be their greatest drawback, as they do not offer a wide variety of flavors. Their only offerings are the four traditional flavors listed previously. They do not have any fun, seasonal varieties throughout the year, and do not offer any one-of-a-kind, unique formulations or flavors. They also do not have vegan, gluten-free, sugar-free or Kosher options. Due to their small selection of brownie and gift options, New York Brownies does not offer a brownie of the month club at this time, which is a perk we would love to purchase as a gift or a treat for ourselves. Although they do not offer their brownies for individual purchase, New York Brownies’ set of four is available for only $11.99, an excellent value for four of their decadent, gourmet brownies. Their beautifully-packaged sets of 12 are $29.99, while sets of 16 are $39.99. When the price is broken down, these brownies are less than $3.00 per brownie for the set of four, and less than $2.50 each for the sets of 12 and 16. All of New York Brownies’ products are individually wrapped in cellophane and placed into their signature boxes. Although they do not offer any protective wrapping or packaging, you can be confident that your order will arrive fresh and damage-free thanks to their commitment to customer satisfaction. They will provide a credit, return or exchange for anyone that is not completely satisfied. As previously discussed, New York Brownies offers three main gift box options: sets of four, 12 or 16. All of these gift boxes can be customized to include one or two flavors, and the 12 and 16-pack sets can also come in an assortment of all of their wonderful flavors. Each of the brownies included in these sets are individually wrapped and boxed in the vendor’s elegant white and brown packaging. While we would like to see more gift options, we do appreciate the simplicity of their approach, which simplifies the hunt for the perfect gift. Again, due to their nothing-but-the-basics approach, New York Brownies does not offer holiday-themed or special occasion gift wrapping. They also do not have a corporate gift program at the moment. New York Brownies has an excellent customer satisfaction guarantee, offering an exchange, refund or credit for any item that is anything less than the best. Like everything else with this vendor, their website is very simple and easy-to-use. Orders can be placed securely through their website. Any questions or concerns can be directed to their customer service representatives through a form on their website or by email. They do not have order placement or customer service available via phone at this time, and also do not offer live chat. Their website does not include an FAQs section and does not have any fun, interactive features like a blog or recipes. Thanks to their four traditional flavor offerings, this vendor is ideal for individuals that love classic brownies. Their brownies are the perfect consistency for lovers of both fudgy and cakey brownie styles. The limited flavors and gift options from this vendor are perfect for people that don’t like a lot of choices and for those that find it refreshing to only make a few decisions while gift shopping. However, those that love variety and unique baked goods will not like this vendor. We like that New York Brownies has perfected the blend of fudgy and cakey into one brownie that will satisfy every chocolate lover. We find their straightforward approach to the gift giving process refreshing, with their three solid gift set options. Although we do appreciate their no-frills approach to brownies, we do wish that New York Brownies offered more flavors and variety in both their brownies and their gift wrapping. We would love to have the option of seasonal and corporate gift customization. Another drawback of this bakery is that they have no options for those that need gluten-free, sugar-free, vegan or Kosher options. A New York-based bakery perfecting classic flavors and packaging them up as gifts for brownie-lovers everywhere.